Nanotechnology involves the utilisation of robotic machines that are at a near subatomic scale. These microscopic machines are known as nanobots. At the moment they are only at a theoretical stage of development. However if they do become commercially available nanobots will have a number of useful applications. 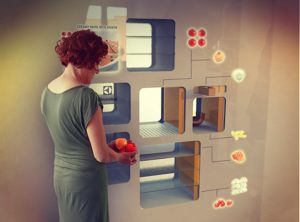 Nano-based devices could be utilised in the kitchen to make working in this environment quicker and easier than ever. How Could Nanotechnology Be Used? A kitchen counter top can get dirty very quickly. Even when it is clean it is only a matter of time before grime, excess dirt or food stains the surface once again. Future counters could be fitted with devices that clean off any dirt on a nano level. Nanobots could be used to repel any water or unwanted surface elements, leaving the counter constantly spotless. The device could also use nanobots to physically push any excess dirt off the counter and onto the floor for brushing away. This technology could also be employed to create a device that places dirt particles into a compartment to be disposed of later. This would mean you would never again have to wipe down a counter surface. It would save money on cleaning products and be great for the environment. It is a fact of life that every so often we must vacuum the kitchen floor. But what if your floor was self cleaning? In the future we may see devices that release nanobots to physically scrape away and remove dust from kitchen floors. If these devices were always working it would mean that a kitchen was constantly clean. Despite being the place that stores food a fridge can often be the most unclean part of a kitchen. If the same nanotechnology that created self cleaning floors and counters was used inside a fridge it would make food hygiene safer. It would also eliminate the use of potentially harmful chemical sprays.